W.A. Rogers created this illustration of President McKinley taking his place with other martyred American Presidents. Entitled "At the Threshold," the drawing appeared in the September 14, 1901 issue of Harper’s Weekly (at page 909). The image is online via the Library of Congress. Click on it for a better view. William McKinley was 58 years old on September 13, 1901. Lying in a coma at the home of John Milburn, where he was taken following surgery, the President was given oxygen which revived him. He asked for his wife. Frail herself, she was doing the best she could to handle the strain. Meanwhile, the press and concerned citizens awaited briefings outside the Milburn house. Mrs. McKinley knew her husband was dying. People in the room looked away so the couple could have privacy. It was time to say their good-byes. God's will, not ours, be done. It is over. The President is dead. 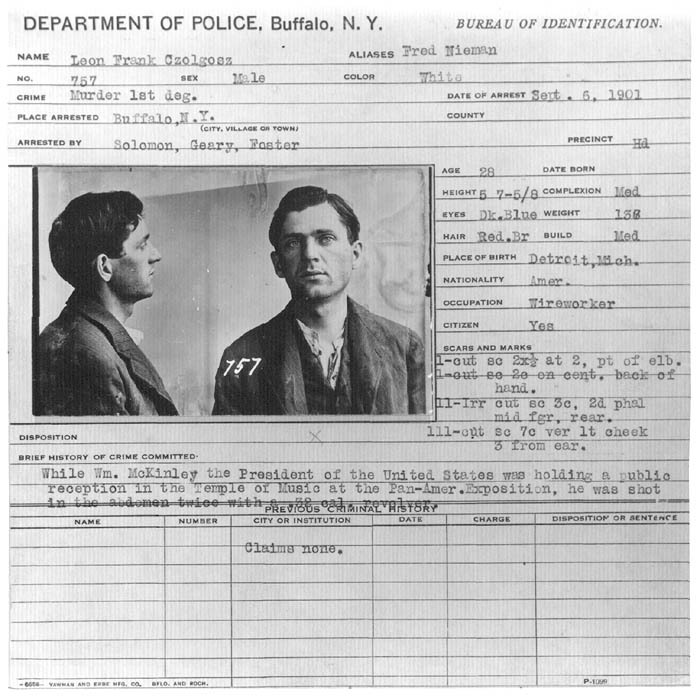 Leon Czolgosz had just become a murderer. Teddy Roosevelt would become the next President. Bos, Carole "IT IS OVER" AwesomeStories.com. Jun 01, 2005. Apr 20, 2019.